Originally, the root name servers were given domain names reflecting the organizations that ran them. In these historical names we can see a veritable who's who of the big players in the development of the Internet: ISI, NASA, the United States military and others. Several of the servers are still run by government agencies or the US military, where added security can be put into place to protect them. For convenience, however, all the root name servers are now given alphabetical letter names in the special domain root-servers.net. Table 167 shows the most current information about the DNS root name servers as of the date of publishing of this Guide. 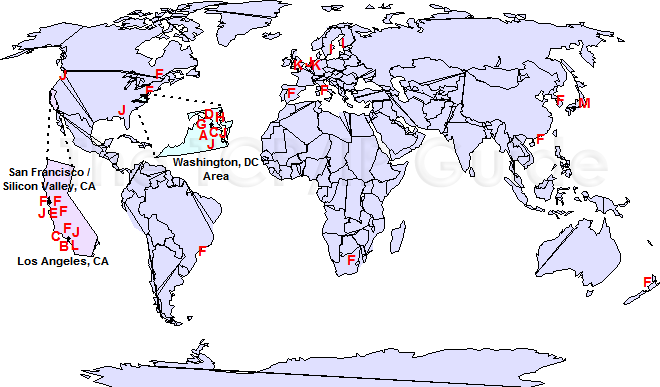 For your interest and amusement I have also mapped the locations of these servers in Figure 242. On The Web: The current list of root name servers can be found in the file ftp://ftp.rs.internic.net/domain/named.root. You can also find the information in a more user-friendly format at http://www.root-servers.org.